Interval training is a great way to increase your speed if you are training for a race (see more here). Living in New York, however, makes it difficult to find a place where you can run 400m repeats without having to pick through a crowd or worry about traffic. 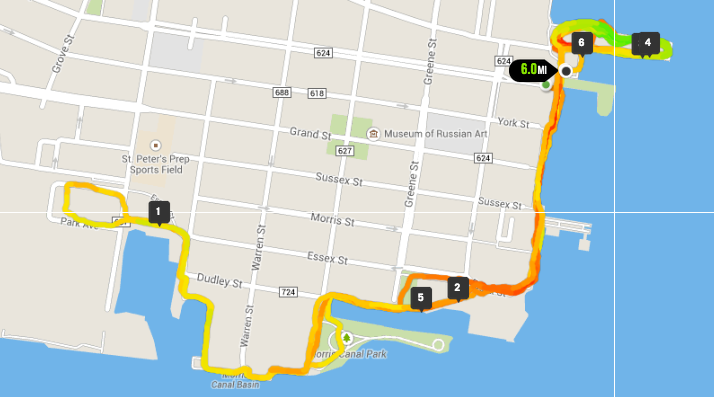 Fortunately, there is a mostly runner friendly circuit to do this on the Jersey City waterfront including a place to conduct an interesting warm-up and warm-down run. (Run 4/2/15) Starting in front of 10 Exchange Place on the waterfront, progress south and then west along the water for a mile and return to the pier where the Hyatt Hotel resides. The 400 meter route starts from the dead end street on the south side of the hotel and progresses to the end of the pier and back around on the north side to the western end of the hotel. Recover by jogging back around to the starting point and back and forth in front of the PATH station. Warm-down run back along the water for the desired amount of recovery. Probably safe to about 11pm. Minimal; plenty of room to run without dodging, especially around the hotel. Cement, wooden planks, and cinder block. None. Maybe in the hotel bathroom? Great views of downtown Manhattan, Statue of Liberty, and Ellis Island. It can definitely accommodate groups with the wide waterfront walkways. Yes, virtually no cars except for crossing the hotel driveway entrance after each interval. Be careful! It’s easy to walk in front of a car in a state of exhaustion.